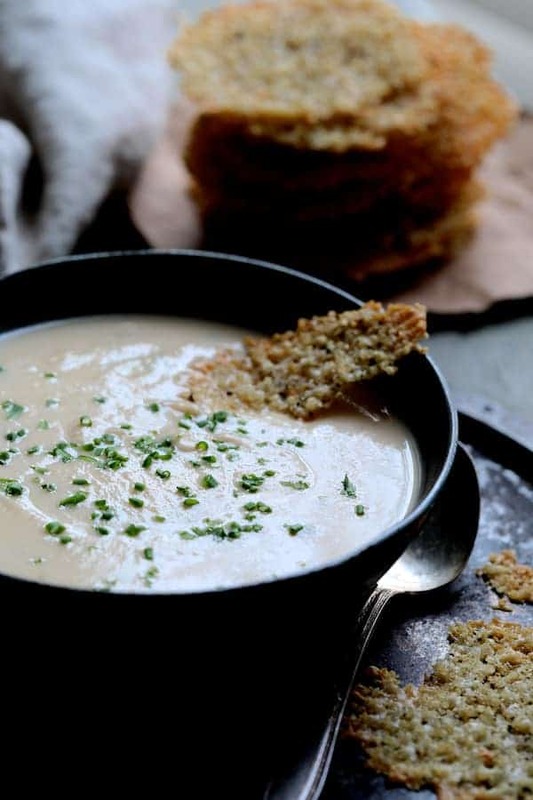 Creamy White Bean Rutabaga and Roasted Garlic Soup with Quinoa Parmesan Crisps makes a lovely light winter supper, lunch or elegant starter. 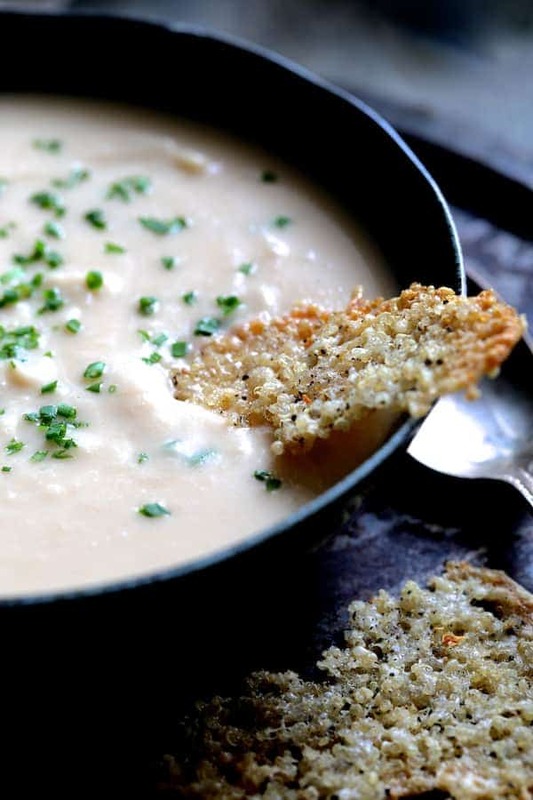 Best of all, this rich and creamy soup is actually quite healthy! The poor, poor rutabaga. It’s not a very pretty vegetable and many people don’t even know what it is or what to do with it. Quite often when I’m in the process of purchasing one, the person checking me out has to ask me what it is. And really, couldn’t someone have come up with a better name? 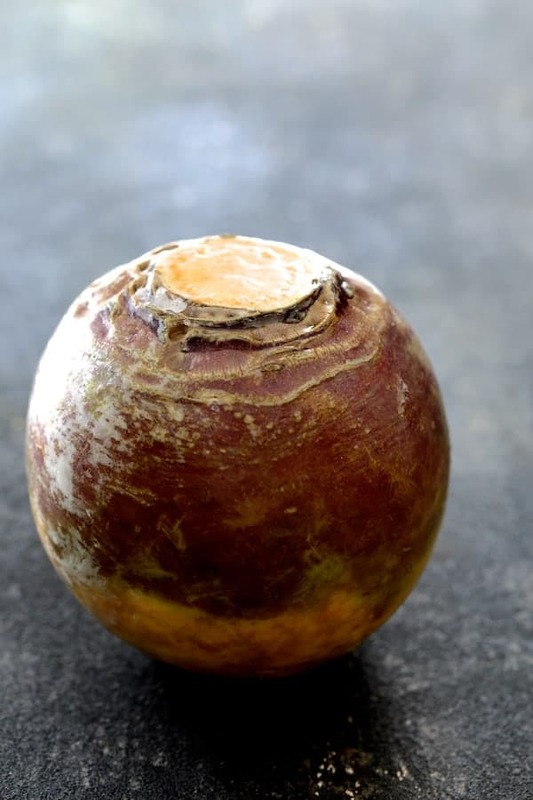 The rutabaga (also known as a Swede or Swedish turnip) is a cross between the turnip and cabbage which makes it a cruciferous vegetable. We know cruciferous vegetables are very good for us! Rutabagas can grow quite large, however, I avoid the really large ones because they’re extremely difficult to cut and can be fibrous in the center. They are often sold coated with a thick layer of wax which helps to preserve them. To cut a rutabaga, slice the top and bottom off first. Then, remove the peel by cutting down toward the cutting board, rotating the rutabaga as you go. The technique I use is similar to the way I do butternut squash in this recipe. First of all, I needed to use this garlic or toss it. I hate throwing food out! Then, I did a little research on whether garlic that has begun to sprout is so terrible and turns out, it’s not. It’s actually a good thing! The belief that green garlic shoots are bitter is old-fashioned and outdated. According to Prevention.com, sprouted garlic has tons of beneficial compounds just like a rutabaga! There was no hint of bitterness at all from the garlic in this soup. My husband took this soup to a church potluck the night I made it and it received rave reviews! White kidney beans (also known as cannellini beans) add protein and also help to thicken the soup. A touch of cream adds a luxurious touch! 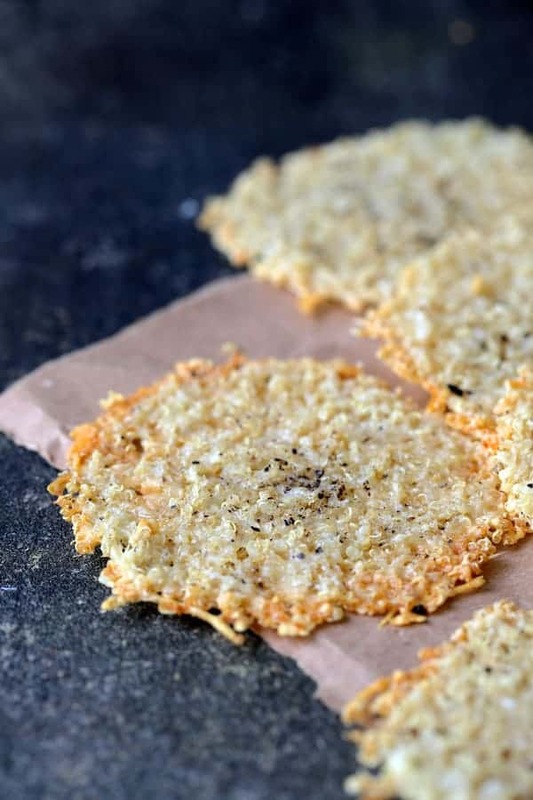 These Quinoa – Parmesan Crisps pair perfectly with this Creamy White Bean Rutabaga and Roasted Garlic Soup. To make the crisps, you’ll need two cups of cooked quinoa. When I cook quinoa, I like to make a big batch and then freeze it in small bags so I always have it ready to go for recipes like this. Then add two cups of grated Parmesan cheese and black pepper for a little kick! Silicone baking sheet liners come in very handy for this recipe, however, you can also use parchment paper. 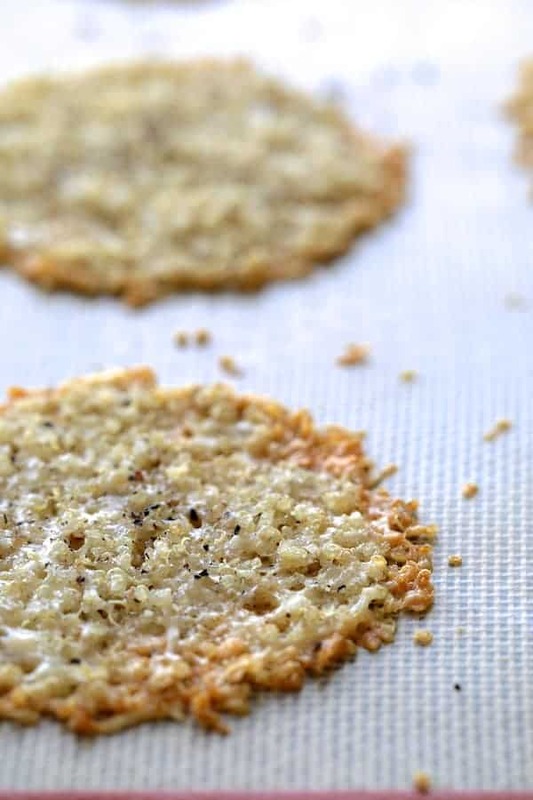 Drop the quinoa and parmesan combination by heaping tablespoons onto the silicone liner (or parchment paper) then press down and form into flat disks. Once formed, bake until the edges are golden brown and they hold together. That’s it! 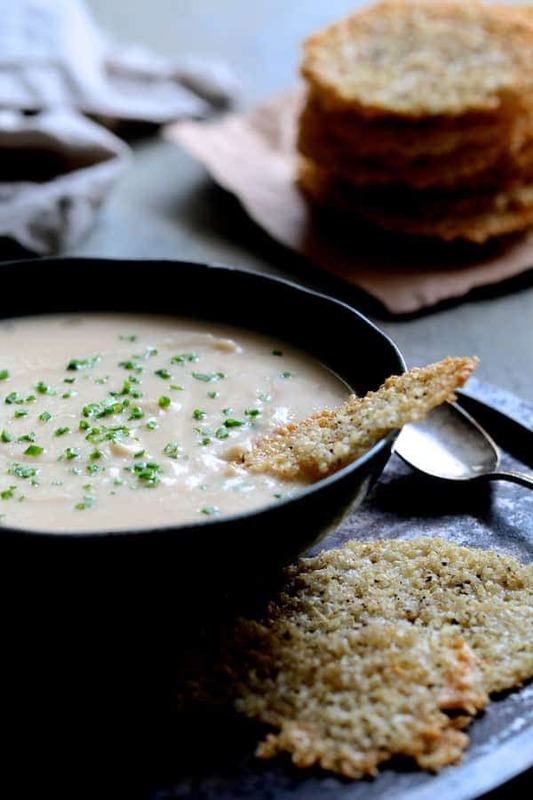 Creamy White Bean Rutabaga and Roasted Garlic Soup with Quinoa – Parmesan Crisps will get you rave reviews! 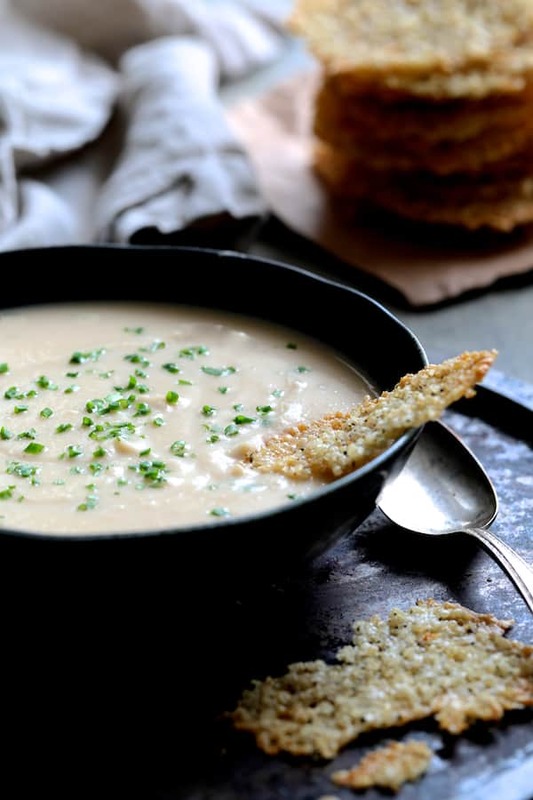 Be sure to try some of my other smooth and creamy soups! SOUP: Preheat oven to 400 degrees. Slice the top off each head of garlic. Place in a small baking dish. Drizzle each head with 1 tablespoon olive oil, making sure the oil gets down into the head of garlic. Cover with aluminum foil. 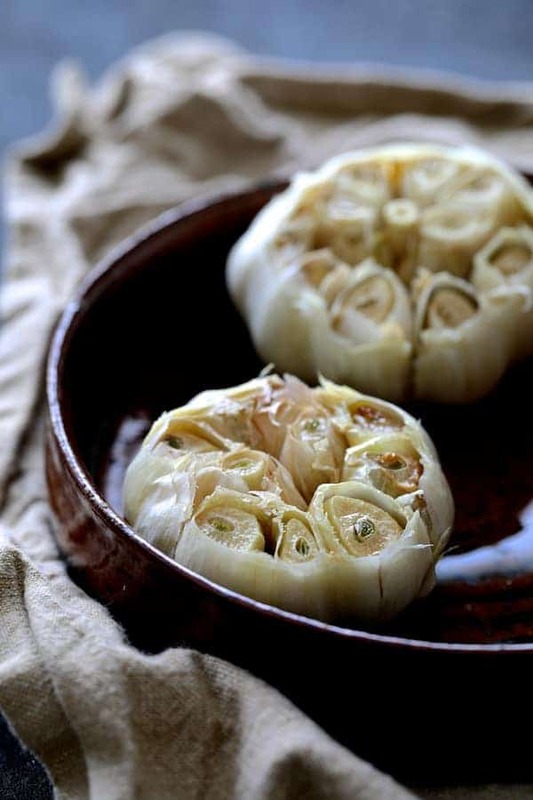 Bake for 30 to 40 minutes or until garlic is soft. When cool to the touch, carefully squeeze the garlic out and set aside. Keep oven at 400 degrees to make the quinoa crisps. Meanwhile, heat remaining 2 tablespoons oil and butter in a Dutch oven or large pot or medium-high heat. Add the onion with salt to taste, reduce heat to medium and cook 5 to 6 minutes or until onion is beginning to soften. Add the rutabaga, stir, then add the chicken or vegetable broth. 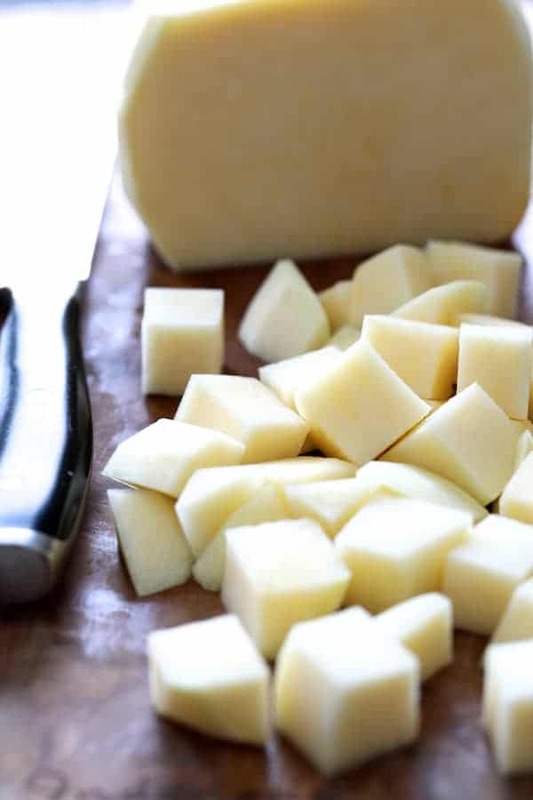 Bring to a boil, cover slightly, reduce heat to medium-low and cook 15 to 20 minutes or until the rutabaga is soft and easily cuts with a knife. Add the beans, roasted garlic and heavy cream. Puree until smooth with an immersion blender. 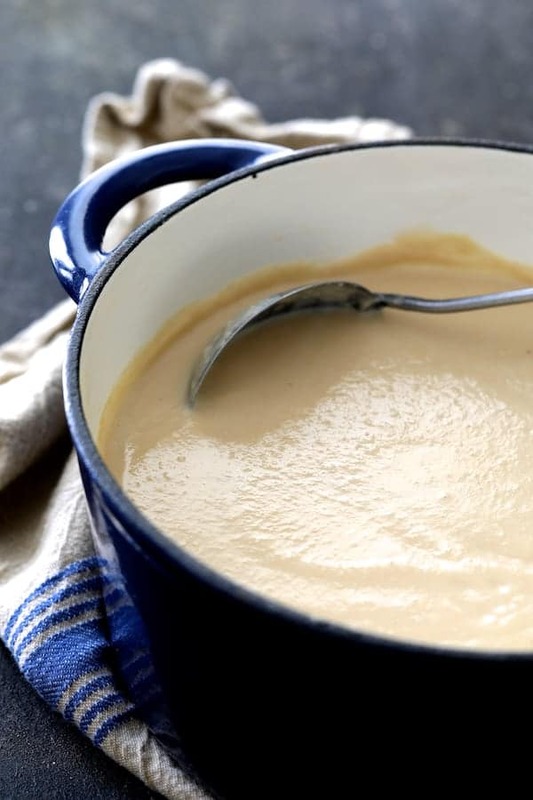 Alternately, puree in batches in a food processor or blender until smooth. Season to taste with salt and white pepper. CRISPS: Keep oven at 400 degrees from roasting the garlic. 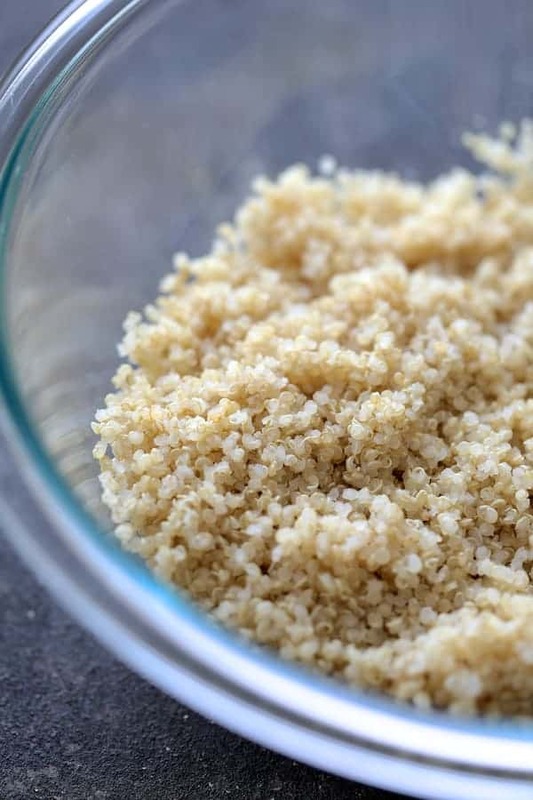 Combine cooked quinoa, parmesan cheese and black pepper to taste in a bowl. Place heaping tablespoons of the mixture on a silicone or parchment-lined baking sheet. Press the mixture down and form into large, flat circles. Bake for 8 to 10 minutes or until lightly browned and holding together. If making this to serve later, use two cans of beans instead of three. The soup will thicken substantially while refrigerated. Hi! Thoughts on skipping the heavy cream? And using milk, almond milk, or greek yogurt? Hi, Hope, Thanks so much for your question. You could use milk or Greek yogurt. Is half-and-half too much? Keep in mind the yogurt is going to add a bit of “tang.” Not too sure about the almond milk; thinking that could change the flavor. Let me know what you end up doing and how it turned out. Thanks so much! Just didn’t have heavy cream on me! I used almond milk and a little extra butter (didn’t want to risk the tanginess of yogurt) and it tasted good! Thanks, Hope! That’s a great solution and glad you enjoyed! I think rutabagas are seriously underrated so I’m happy to see you enjoyed the soup. Thanks again and please stay in touch. 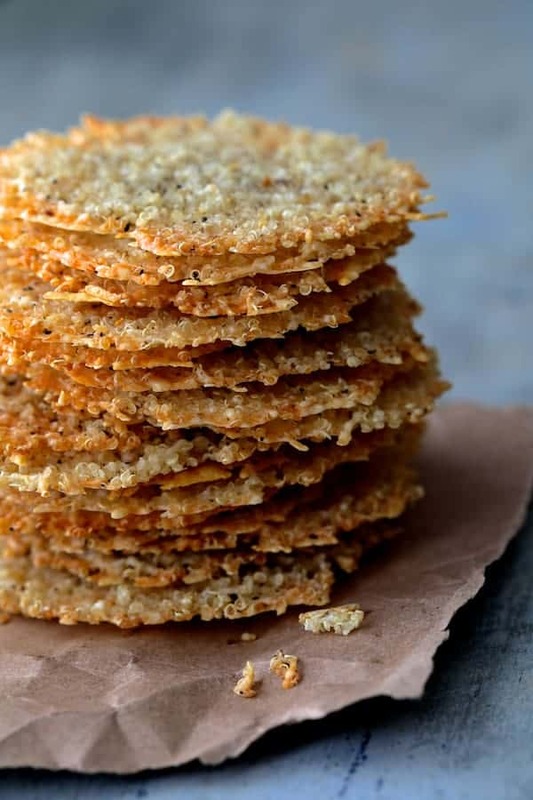 Looks delicious, but what temperature do you use to cook the quinoa crisps? 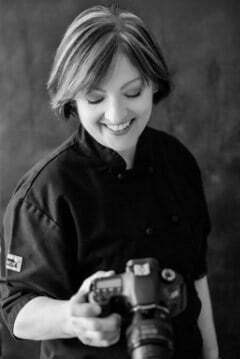 Hi, Renana, Thanks so much for your great question. You bake them at 400 degrees like the garlic. I will update the recipe to be more specific. Thanks again and hope you enjoy!